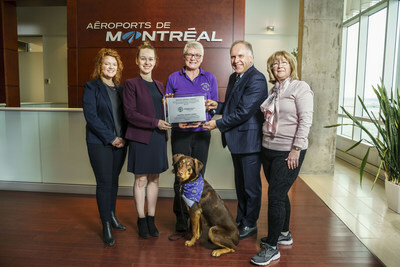 MONTRÉAL, March 26, 2019 /CNW Telbec/ - Montréal-Trudeau Airport (YUL) has been awarded an honourary plaque for its Pet Squad. This recognition by Humane Society International/Canada (HSI/Canada) highlights initiatives that promote the benefits offered by pets. Since the beginning of October, a squad composed of 30 dogs has been delighting Montréal-Trudeau passengers. Developed in collaboration with the Companion Animal Adoptions Centres of Québec (CaacQ), the squad's mission is to roam around the terminal to offer moments of comfort to travellers. This initiative is highly appreciated by passengers who are more nervous or anxious in an airport environment. "Aéroports de Montréal is very proud to have received this honourary plaque highlighting the importance of the YUL Pet Squad project. Since its launch, the great deal of positive feedback received has confirmed the originality and effectiveness of this initiative, which provides passengers with an entertaining and comforting experience in a unique context," said Philippe Rainville, President and CEO of Aéroports de Montréal. Ewa Demianowicz, senior campaign manager for HSI/Canada added, "Part of our organization's mission and slogan is 'celebrating animals,' and we believe that the YUL Pet Squad project symbolizes it perfectly. This program underscores the special connection between humans and dogs, while reminding us that pets are full members of the community. We congratulate Montréal-Trudeau Airport for this excellent initiative and we wish it tremendous success." Aéroports de Montréal is the airport authority for the Greater Montréal area responsible for the management, operation and development of Montréal-Trudeau International Airport and the Mirabel aeronautic and industrial park.